Article not written by me. It's advertorial. 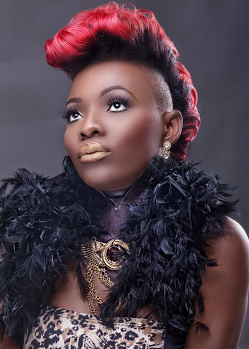 Read below..
Have you noticed the striking resemblance between songstresses Lamili and Yemi Alade? well we have, take a close look at both artist and you will agree with me that their style is quite similar, so is their fashion sense which is beautiful by the way. However you would wonder if one was simply copying the other or should we say one is being influenced by the other? whatever the case may be, these two beautiful ladies are doing us proud with their music both home and abroad. We ran into LAMILI recently and asked her about the similarity between her and Yemi Alade, she told us she certainly isn't copying or being influenced by Yemi Alade neither does she think reverse is the case, she said she respects Yemi Alade's talent being a sister in the same hustle and even hinted that there might be a collaboration between them to further help fans distinguish that they are two different people doing beautiful music. 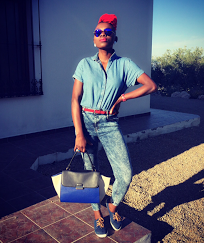 Lamili also wished Yemi Alade the best of luck on her nomination at the 2015 MAMA Awards. Lamili who recently won the award for the most Promising Afro Pop Female Artist of the year at the just concluded Elite Awards sponsored by the Ogun state government, released a song featuring Timaya titled RADICAL and have shot the video which was directed by Music Video director PRODIGY. According to LAMILI the Radical video drops in the days ahead and she promises its like none she's done before. Well we certainly cant wait to see the Radical video and also look forward to a collaboration between LAMILI and Yemi Alade, we bet its going to be a Hot one... Big Ups Ladies.